Agenda: SCP / Performance Evaluations Food provided. Please RSVP by April 19 to joan.bjones@rutgers.edu. New Brunswick Executive Board member Heather DeMeo will hold “office hours”. This professional development opportunity is open to URA full‐dues members only. RSVP to union@ura-aft.org. We encourage you to provide your questions to union@ura-aft.org ahead of time. Agenda: SCP Raises and Other Campus Issues (For full‐dues members; membership forms available at the door) Please RSVP to joan.bjones@rutgers.edu. Full members only; membership applications are available at the door. Topics: SCP Review and Contract Campaign Lunch provided. Please RSVP to Sue Skelly at skelly@dls.rutgers.edu or Christine O’Connell at coconnell@ura-aft.org. Video‐conferencing between the Cook Campus in Room 133, Labor Education Center; Newark Campus in the Special Collection Room, 4th floor, Dana Library; and Camden Campus. 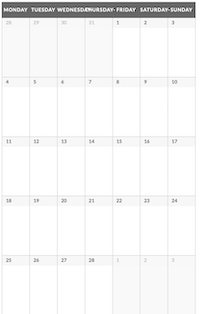 Special Agenda: SAS Realignment Open to full dues members only. Membership forms available at the door. Reclassification 101: http://www.ura-aft.org/2017/09/13/ura-aft-workshop-does-your-job-title-match-your-job 12:00 pm-1:00 pm (with Q & A to follow) Baker Trial Courtroom, 1st fl., Center for Law and Justice, Newark Campus RSVP to uraaft.newark@gmail.com by 9/25. Lunch will be provided. Reclassification 102 (Part Deux): Small group review of draft CARF http://www.ura-aft.org/2017/09/13/ura-aft-workshop-does-your-job-title-match-your-job 5:00 pm-7:00 pm at URA Office, 57 Paterson St., 2nd Fl., New Brunswick, NJ This session is for members who have already attended the 101 workshop and prepared a draft of their CARF. RSVP to Christine O’Connell at coconnell@ura-aft.org by 9/25. Topic: Contract Needs and Other Issues Lunch provided. Please RSVP to Kristina Wetter at kwetter@physics.rutgers.edu or 848–445-8867. Full members only; membership applications available at door. Cook Campus in Room 133, Labor Education Center; Open to full dues members only. Membership forms available at the door. Livingston Campus Meeting scheduled for next Wed. Oct. 11th at Rutgers Business School, room 4095, 12–1. Please RSVP to Leigh‐Anne Cobb at lcobb@business.rutgers.edu. Pizza will be provided. Membership forms available at the door. Topic: SAS Realignment and Contract Campaign Lunch Provided. Please RSVP to Sue Skelly at skelly@dls.rutgers.edu or Barbara Nowakowski at Barbara@cabm.rutgers.edu. All are welcome, membership applications available at the door. West C Conference Room, Camden Campus Center, 326 Penn St.
Reclassification 101: http://www.ura-aft.org/2017/09/13/ura-aft-workshop-does-your-job-title-match-your-job 12:00 pm-1:00 pm at West C Conference Room, Camden Campus Center, Camden Campus RSVP to Mike Ballard at mballard@camden.rutgers.edu by 10/23. Topic: Contract Campaign Lunch Provided. Please RSVP to Pat LaSasso at plasasso@finance.rutgers.edu or Christopher Pflaum at cpflaum@ored.rutgers.edu by October 30th. Members only, membership applications available at the door. Room 237, Robeson Campus Center, Newark Campus, 350 Dr. Martin Luther King Jr. Blvd. Agenda: Rights under the URA Contract Report on 11/19 “Open the Books” presentation Upcoming URA events in November and December Membership forms available at the door. Please RSVP by 11/13/17 to Lisa Scott at lsscott@registrar.rutgers.edu. Admission is free to all signed dues‐paying members, but you must reserve your space by Tuesday, November 28, 2017. RSVP to khopfel@ura-aft.org. Reclassification 101: http://www.ura-aft.org/2017/09/13/ura-aft-workshop-does-your-job-title-match-your-job 12:00 pm-1:00 pm at Room 135 A and B, 33 Knightsbridge Road, Piscataway, NJ 08854 Members only; membership cards available at door Please RSVP to Christine O’Connell at coconnell@ura-aft.org by 12/8 or call 732–745-0300. Lunch provided. Santa’s Helpers have worked hard all year, it’s time for a party because the Holidays are here! Wednesday, December 20, 2017 West ABC 12 — 1:30pm RSVP by emailing Maria Buckley at maria.buckley@rutgers.edu This is a member only event. Download flier here. Reclassification 101: http://www.ura-aft.org/2017/09/13/ura-aft-workshop-does-your-job-title-match-your-job 12:00 pm-1:00 pm at Room 135 A and B, 33 Knightsbridge Road, Piscataway, NJ 08854 Members only; membership cards available at door Please RSVP to Christine O’Connell at coconnell@ura-aft.org by 1/3 or call 732–745-0300. Lunch provided. Reclassification 101: http://www.ura-aft.org/2017/09/13/ura-aft-workshop-does-your-job-title-match-your-job 12:00 pm-1:00 pm at Room 4052, Rutgers Academic Building, West Wing, 15 Seminary Place, College Avenue Campus Members only; membership cards available at door Please RSVP to Christine O’Connell at coconnell@ura-aft.org by 1/26 or call 732–745-0300. Lunch provided. Topic: Bargaining our 2018 contract How do we get to the table? What do we bargain for? How can we fight and win a fair contract? Come any time between noon and 1:30pm. Bring your own lunch. No need to RSVP. Just make time to educate and help yourself. URA meetings are open to signed, full‐dues members only. Not a full member yet? Not sure? Membership applications are available at the door or on the URA website. Reclassification 101: http://www.ura-aft.org/2017/09/13/ura-aft-workshop-does-your-job-title-match-your-job 12:00 pm-1:00 pm at Room 133, Labor Education Center, 50 Labor Center Way, Cook Campus Members only; membership cards available at door Please RSVP to Christine O’Connell at coconnell@ura-aft.org by 2/9 or call 732–745-0300. Lunch provided. Live from Cook Campus in Room 133, Labor Education Center and video‐conferencing with Dana Room, 4th fl., Dana Library, Newark Campus Special Topics: Bargaining Update Nomination for 2018 AFT Convention, July 13–16, 2018, Pittsburgh, PA WILD Conference, March 2–3, 2018, East Brunswick, NJ Open to full dues members only. Membership forms available at the door. Where: Rm. 133, Labor Education Center, Cook Campus When: March 19 @ 5:30 pm — 7:00 pm EDT Special Topic: CORNERSTONE Report Important Business: Election of Bargaining Team Election of Delegates for 2018 AFT Convention, July 13–16, 2018, Pittsburgh, PA Camden and Newark members, please check your email for further voting information Open to full dues members only. Membership forms available at the door. When: March 20, 2018 from 12pm – 1:30pm Where: Bush Student Center, Rm. 116 A, Busch Campus Why: Please Join Us In A Discussion on Bargaining for Healthcare. Let your voice be heard. RSVP to Lisa Scott at lsscott@registrar.rutgers.edu. Where: Room 4052 West Wing, Rutgers Academic Building, CAC When: April 4, 2018 at 12 p.m. RSVP to Kay Schechter at kays@rutgers.edu. Membership forms available at the door. Where: CCR‐201, Busch Campus When: April 5, 2018 at 12:00 p.m. Membership forms available at the door. Where: Room 4095, Rutgers Business School, Livingston Campus When: April 6, 2018 at 12:00 p.m. RSVP to lcobb@business.rutgers.edu. Membership forms available at the door. Agenda: First reading of the Budget Cook Campus in Room 133, Labor Education Center; Open to full dues members only. Membership forms available at the door. Reclassification 102 (Part Deux): Small group review of draft CARF http://www.ura-aft.org/2017/09/13/ura-aft-workshop-does-your-job-title-match-your-job 5:00 pm-7:00 pm at Room 4095, Rutgers Business School, Livingston Campus This session is for members who have already attended the 101 workshop and prepared a draft of their CARF. Members only; membership cards available at door. Please RSVP to Christine O’Connell at coconnell@ura-aft.org by 4/6 or call 732–745-0300. Reclassification 102 (Part Deux): Small group review of draft CARF http://www.ura-aft.org/2017/09/13/ura-aft-workshop-does-your-job-title-match-your-job 5:00 pm-7:00 pm at Conference Room, Davidson Hall, Busch Campus This session is for members who have already attended the 101 workshop and prepared a draft of their CARF. Members only; membership cards available at door. Please RSVP to Christine O’Connell at coconnell@ura-aft.org by 4/6 or call 732–745‑0300. When: Thursday, April 19, 2018 at 12pm Where: Nelson Lab Building, Room D406 Lunch provided URA‐AFT staff in ARC, EOHSI, LSB, LSM, & Psychology are all welcome. Full members only: membership app available at door Topics: Bargaining updates and SCP review Please rsvp to Sue Skelly at skelly@dls.rutgers.edu or Barbara Nowakowski at barbara@cabm.rutgers.edu by April 16th. Reclassification 101: http://www.ura-aft.org/2017/09/13/ura-aft-workshop-does-your-job-title-match-your-job 12:00 pm-1:00 pm in Room 385E, Serin Physics Building, Busch Campus Members only; membership cards available at door Please RSVP to Christine O’Connell at coconnell@ura-aft.org by 4/20 or call 732–745-0300. Lunch provided. Agenda: Second Reading and Vote on the Budget Douglass Campus in Room 101, Hickman Hall. Open to full dues members only. Membership forms available at the door. Where: Room 3095, Rutgers Business School, Livingston Campus When: Wednesday, May 30, 2018 Time: 12:00 pm — 1:00 pm RSVP to lcobb@business.rutgers.edu. Membership forms available at the door. The summer of 2018 has been anything but quiet for the URA bargaining team and leadership. Come to a bargaining update on Thursday, August 16 from 12:15 to 1:30 in Conklin Hall, room 346 and get the latest news direct from some of the bargaining team members. BYO lunch. An update is also available on the URA website. URA meetings are open to signed members. Membership applications are also available at the door. Reclassification 102 (Part Deux): Small group review of draft CARF http://www.ura-aft.org/2017/09/13/ura-aft-workshop-does-your-job-title-match-your-job 5:00 pm-7:00 pm in Room 122, Center for Law and Justice, 123 Washington Street, Newark Campus This session is for members who have already attended the 101 workshop and prepared a draft of their CARF. RSVP to Christine O’Connell at coconnell@ura-aft.org by 8/20/2018. Agenda: Health Insurance: What do we want? How do we get it? Update on Contract Talks and Action Plans What We’re Doing about Management Union‐Busting after Janus V. AFSCME Labor Action for November Elections Room 116, Busch Student Center, Busch Campus. Video‐conferencing with Newark Campus in Special Collections Rm, 4th Fl., Dana Library and Camden Campus in Rm. 231, Business and Science Bldg. Open to members only. Membership forms available at the door. Join Faculty Staff and Students asking the tough questions at the University Senate meeting 12:30pm-3:30pm on Friday, September 21, College Avenue Student Center, College Avenue Campus. Download this flier for additional information. Agenda: Bargaining Update Date: Wednesday, October 3 Time: 12:15pm to 1:15pm Location: Center for Law and Justice, Baker Trial Courtroom (125) Feel free to bring your own lunch. Signed members only; membership forms available at the door. 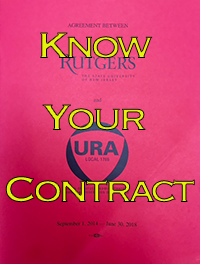 Agenda: Bargaining Update Date: Thursday, October 18, 2018 Time: 12:15pm to 1:15pm Location: Room 1123, Rutgers Business School, 1 Washington Street Please RSVP to uraaft.newark@gmail.com, food will be provided. Signed members only; membership forms available at the door. RSVP your attendance to Eric Himsel at ehimsel@ura-aft.org. RSVP your attendance to Eric Himsel at ehimsel@ura-aft.org by November 27th. RSVP your attendance to Eric Himsel at ehimsel@ura-aft.org by December 6th. Center for Ceramics Research Room 201 Pizza served for those who RSVP. At this meeting, we will share a brief bargaining update and have discussions on actions that we are taking moving forward. Please rsvp to ensure that we have materials and pizza for all. Also, please bring your own drinks. As a member driven union, we need to hear your ideas and get your input. 33 Knightsbridge Road Building 135 B. Come and join your colleagues at 33 Knightsbridge Road to show leadership who we are and what we do, collectively. T‐shirts and buttons will be provided. Make your own sign or bring one already made. Come join us and support the bargaining team at ASB II as they meet with management. Wear your t‐shirts and buttons and call for fair contracts. T‐shirts and buttons will be provided if you don’t already have one. Make your own sign there or bring one.